Navin Gulia severely injured his neck and spine while clearing an obstacle in a competition at the Indian Military Academy, where he was in the final term as a gentleman cadet.He was 22 years old then. Refusing to let his disability define him, he decided to conquer the world in a wheelchair. He created a modification kit to allow him to drive a car and has notched up over 200,000 kms driving up the Himalayas in Uttaranchal, Himachal and Ladakh. He has driven up to the Khardung La (pass) in Ladakh, then the highest motorable pass in the world. He has also practised flying powered hang-gliders. 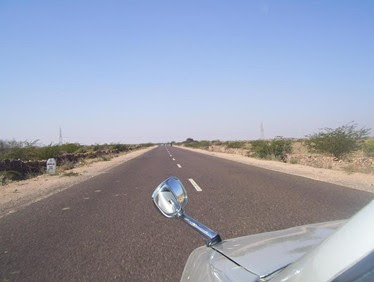 Here he writes about his experiences driving from Delhi to the Indo-Pak Border. Growing up, deserts have caught my fancy a number of times. From movies like ‘Omar Mukhtar – lion of the desert’ to the Hindi classic ‘Lamhe’ and books and stories on deserts. I had no real experience of the desert except what I had read. 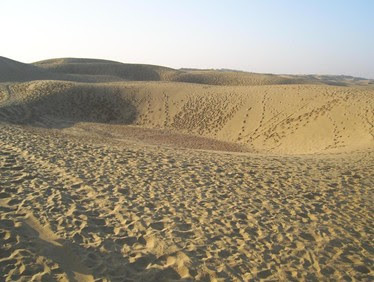 Going to Jaisalmer, the essence of deserts in India and the beginning of Thar, had been my fantasy for a long time. When I got a call from the Ability Foundation to go on an assignment to Jodhpur, I grabbed it. Jaisalmer was 300 kms away and the India Pakistan border another 140kms. My wife Khushi and I started at 11 p.m. from Gurgaon, Haryana on a foggy night in December. All my years and kilometers behind the wheel have taught me one thing “if you wanna be safe, anticipate trouble all the time, every second”. Driving is zen for me, its philosophy and its religion. Onto the expressway from Gurgaon, the fog greeted me soon enough. I started driving with foggy care and grabbed onto every opportunity of tailing a vehichle which could do ‘the seeing Job’ for me. Jaipur came and went, onto Kishangarh and Ajmer. Early morning we neared Bewar from where I had to leave ‘my beloved’ Delhi Mumbai National Highway 8 (the only national highway in my knowledge where you could average over 80kmph for 24hrs) and turn right to get onto uncharted road going to Jodhpur. We stopped at Bewar for 4-5 cups of hot tea. I anticipated being in Jodhpur by afternoon. On the road again. We climbed over a few small hills and started driving amongst vast sandy and bushy plains. Amazingly we continued the drive at 120 kmph and reached Jodhpur by 9:30 a.m. Wow! A dinner of Rajasthani food, a night spent in the tent and a camel safari in the morning with hot breakfast and it was time to move. I wanted to go ahead and savour the desert a little more. Tanoth, a border village and temple on Indo-Pak border was 120kms. Again we took off and drove through beautiful desert and absolutely deserted desert roads reaching Tanoth by early afternoon. The temple was ahead of us with a border check post/barricade on the right. I wondered if we could be allowed to drive right to the border with Pakistan. Anyways, with all the time in our hands I decided to get down and pray at the temple. Story has it that in 1965 Indo-Pak war the Pakistani forces well equipped with American Patton tanks and weapons had not been able to cross this temple. It was believed that the mother Goddess stopped them. We came out of the temple and I started driving across the check point. The sentry mumbled something and I nodded, he let us pass. We took off again and drove the deserted 15kms till we could see the border fencing with a permanently closed black iron gate. 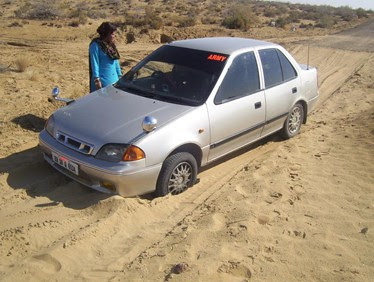 The last 50 metres were too sandy and I doubted if the car would take it or if it would get stuck. I decided to give it a try and of course the car got stuck. Here we were stuck in sand 50 metres from the hostile border with no possible help to come our way except a possible military rescue. Accelerating didn’t get the car out; in fact it dug it deeper so I immediately stopped. Nevertheless, we posed for photographs with our accomplishment. Once Khushi and Mahesh my assistant had had a good look across the border from the fence we started working on the car. Agenda number one, collect and put bricks and stones under wheels. Done, didn’t work, gave me smoking tires. Agenda two, dig out the sand. Done, didn’t work either, left wheel was too deep in. Agenda three, get out the hydraulic jack (yes, I carry it)and lift the left side up and stuff stones under it. Done and the car was out. And we were on our way back. Returning back there was a little hungama at the checkpost as to how we could go to the border without permission. It seems even the proper army vehicles going there need to have permission and orders. Well, my defense was simple ‘you didn’t stop me’ and no sign says ‘no entry’ or something like that. It solved the issue. They completed the formalities for having given me the permission to visit the border after I had come back 🙂 . I wasn’t complaining. We got back to civilization in a few hours. Seeing us get down from the car ( and we evidently appeared ‘Indian’ tourists) a bunch of street kids doubtfully, hesistantly started singing ‘kajra re’. Khushi said ‘no, we don’t want ‘kajra re’ we want rajasthani song’. 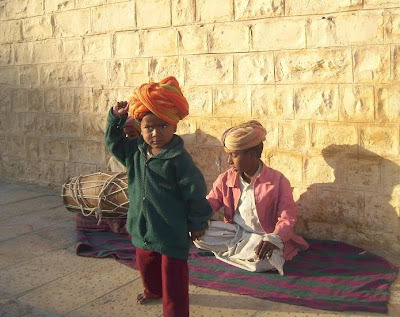 And before she had said the word ‘song’, the boys started off with a melodious, fast, rhythmic Rajasthani folk song. It was a treat for the ears. Ever since I got back, whenever I close my eyes I see desert and dunes and flying sand. Finally, I know where to go if there is no space left in the cities. This entry was posted in Travel and tagged India Travel, travel with disability on February 11, 2008 by vpdot. There’s been alot of controversy over whether to stay or not stay in the Fort. It’s eroding from increased water usage and tourists are contributing to the problem. Check out this link, it shows the different viewpoints so readers can have more info about this important question. I truely enjoyed this post, nice work! If any traveller want any type of tours and travel related, we offers than a great services.